No longer linked by the Kor Mak bracelets, Vala departs through the stargate, but within an hour Daniel collapses and Vala returns. Combining the bracelet technology with the communication terminal may have made the bond more permanent, and Mitchell and Daniel travel through the gate in search of Arlos, from whom Vala stole the bracelets, hoping that he can provide a solution. 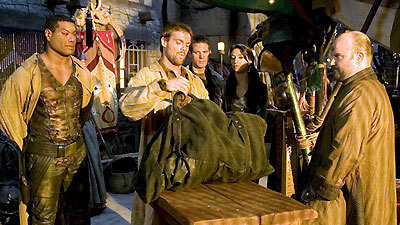 Arlos, however, will only cooperate if Vala is brought before him, and once she arrives, he demands that she return a necklace which she had also stolen from him. The necklace, however, has already been traded to a merchant on another world. Mitchell, Daniel, and Vala confront Inago, offering a deal to recover the necklace, but Inago demands the return of a power coil that Vala has already traded to Caius, a former smuggler posing as a monk and exhibiting the power coil as a priceless relic. He will only agree to help if his cargo ship is returned, but Landry refuses to approve the mission since SG-1's presence is required in Washington to testify for SGC funding. Vala's counterproductive comments at the hearing, however, make Landry more determined than ever to be rid of her, and he approves the mission to recover the cargo ship, now in the hands of the Lucian Alliance. Mitchell, Daniel, Teal'c, and Vala arrange a rendezvous with Tenat and Jup of the Lucian Alliance, a coalition of unscrupulous smugglers and mercenaries. Posing as bounty hunters, their deception to trade Daniel and Vala succeeds and the team acquires the cargo ship, escaping under fire from the Alliance. Exchanging the ship for the power coil, and the power coil for the necklace, the team returns to Arlos, only to learn that he has no solution to counter the bond of the bracelets. Their mission had been for naught, and the team must return to the SGC, hoping that in time the effect will wear off on its own. The Kor Mak bracelets create a physiological bond between the wearers. The lasting effects of the bracelets after their removal may be due to the effects of the Ancient communication device on the technology. The Lucian Alliance is a coalition of former smugglers and mercenaries who've banded together to take advantage of the power vacuum left by the demise of the Goa'uld. The International Committee is throwing its full support behind the Atlantis expedition. The Senate Appropriations Committee intends to cut the SGC budget to 30%. Landry's only option is to convince the International Committee to change their minds and contribute to SGC funding in exchange for a civilian position appointed by the Committee with full access and a say in all major decisions. Grannus was a minor Celtic god, one of Camulus's former lieutenants, until he was executed by his own Jaffa. Inago wears the tattoo of Tilgath. Vala stole the Kor Mak bracelets from Arlos. She also stole Arlos's mother's necklace and traded it to Inago for a power coil, then traded the power coil to Caius for a customized cargo ship, now in the hands of Tenat and Jup.